Cartalucci also discussed the importance of the expansion of NATO, particularly in the context of Ukrainian membership into the organization as a method of expanding the Anglo-European empire to the doorstep of Russia on yet another front. So what is NATO doing with Nazi militants in Ukraine? The same thing Adolf Hitler was doing - establishing "breathing room." While the West attempts publicly to portray the crisis in Ukraine as Europe reacting to Russian aggression, behind semi-closed doors they are very open about their agenda in Ukraine and elsewhere along Russia's peripheries - it is and always was about the expansion of Europe and the containment of Russia. Recently the corporate-funded NATO think tank, the Atlantic Council, celebrated what it called, "anniversaries of crucial importance to the transatlantic community, including the 25th anniversary of the fall of the Berlin Wall, the 15th anniversary of NATO's first post-Cold War enlargement, and the 10th anniversary of the "big bang" enlargements of both the European Union and NATO." These "enlargements" all took place after the fall of the Cold War - in other words, after NATO's mandate for existing expired. Yet the alliance continued to grow, and not only did it grow, in tandem with the European Union, it did so directly toward Moscow's doorstep with every intention of eventually absorbing Russia as well. Of course, Cartalucci was correct in pointing out these aspects of the U.S.-Russian conflict surrounding the Ukrainian crisis. On one level, the United States was responsible for the orchestration of a color revolution inside Ukraine as an attempt to scuttle the warming relations between Ukraine and Russia, thus forcing Russia to respond. On another level, the Anglo-European establishment is attempting to further weaken the geopolitical position of Russia and expand NATO for purposes of containing and eventually dictating policy and demands to the Russian state. On another level still, the conflict taking place between the Anglo-European NATO alliance is the acting out of a script that has been carefully crafted many years ago with end goal of eliminating the very existence of national sovereignty from across the globe and the ultimate creation of a one-world system with a small but dominant minority reigning at the top of that structure. 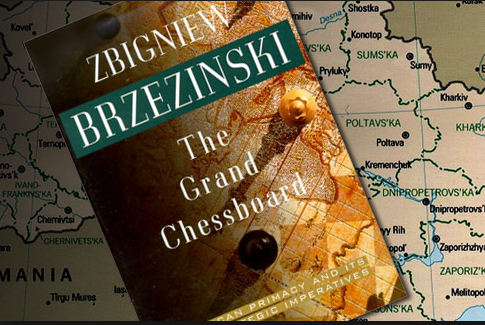 One of the architects of the strategy which is currently being implemented by the United States in regards to foreign policy, Zbigniew Brzezinski, is thus a logical source of information when one is attempting to understand the geopolitical movements made by the Anglo-Europeans, Russians, or Chinese. However, the Grand Chessboard discusses much more than the lack of desire to wage war by the general public absent a perceived external threat. The book discusses in detail the various major players in the geopolitical game and the methods they may use to achieve their goals of hegemony. When one considers the possibility that the events taking place in Eastern Europe are much more than the after effects of seemingly unrelated policy or even those of a series of short-term foreign policy decisions made by one or two world powers, it becomes vitally important to seek out the words of the individuals who would have played a role (and still do play a role) in writing and developing the script the world is now following. As in chess, American global planners must think several moves ahead, anticipating possible countermoves. A sustainable geostrategy must therefore distinguish between the short-run perspective (the next five or so years), the middle term (up to twenty or so years), and the long run (beyond twenty years). Moreover, these phases must be viewed not as watertight compartments but as part of a continuum. The first phase must gradually and consistently lead into the second – indeed, be deliberately pointed toward it – and the second must then lead subsequently into the third. It follows that a wider Europe and an enlarged NATO will serve well both the short-term and the longer-term goals of U.S. policy. A larger Europe will expand the range of American influence – and, through the admission of new Central European members, also increase in the European councils the number of states with a pro-American proclivity – without simultaneously create a Europe politically so integrated that it could soon challenge the United States on geopolitical matters of high importance to America elsewhere, particularly in the Middle East. A politically defined Europe is also essential to the progressive assimilation of Russia into a system of global cooperation. The enlargement of NATO and the EU would serve to reinvigorate Europe’s own waning sense of a larger vocation, while consolidating, to the benefit of both America and Europe, the democratic gains won through the successful termination of the Cold War. At stake in this effort is nothing less than America’s long-range relationship with Europe itself. A new Europe is still taking shape, and if that new Europe is to remain geopolitically a part of the “Euro-Atlantic” space, the expansion of NATO is essential. By the same token, a failure to widen NATO, now that the commitment has been made, would shatter the concept of an expanding Europe and demoralize the Central Europeans. It could even reignite currently dormant or dying Russian geopolitical aspirations in Central Europe. Indeed, the failure of the American-led effort to expand NATO could reawaken even more ambitious Russian desires. It is not yet evident – and the historical record is strongly to the contrary – that the Russian political elite shares Europe’s desire for a strong and enduring American political and military presence. Therefore, while the fostering of an increasingly cooperative relationship with Russia is clearly desirable, it is important for America to send a clear message about its global priorities. If a choice has to be made between a larger Euro-Atlantic system and a better relationship with Russia, the former has to rank incomparably higher to America. For that reason, any accommodation with Russia on the issue of NATO enlargement should not entail an outcome that has the effect of making Russia a defacto decision-making member of the alliance, thereby diluting NATO’s special Euro-Atlantic character while simultaneously relegating its newly admitted members to second-class status. That would create opportunities for Russia to resume not only the effort to regain a sphere of influence in Central Europe but to use its presence within NATO to play on any American-European disagreements in order to reduce the American role in European affairs. It also crucial that, as Central Europe enters NATO, any new security assurances to Russia regarding the region be truly reciprocal and thus mutually reassuring. Restrictions on the deployment of NATO troops and nuclear weapons on the soil of new members can be an important factor in allaying legitimate Russian concerns, but these should be matched by symmetrical Russian assurances regarding the demilitarization of the potentially strategically menacing salient of Kaliningrad and by limits on major troop deployments near the borders of the prospective new members of NATO and the EU. While all of Russia’s newly independent western neighbors are anxious to have a stable and cooperative relationship with Russia, the fact is that they continue to fear it for historically understandable reasons. Hence, the emergence of an equitable NATO/EU accommodation with Russia would be welcomed by all Europeans as a signal that Russia is finally making the much-desired postimperial choice in favor of Europe. Russia’s longer-term role in Eurasia will depend largely on the historic choice that Russia has to make, perhaps still in the course of this decade, regarding its own self-definition. Even with Europe and China increasing the radius of their respective regional influence, Russia will remain in charge of the world’s largest single piece of real estate. It spans ten time zones and is territorially twice as large as either the United States or China, dwarfing in that regard even an enlarged Europe. Hence, territorial deprivation is not Russia’s central problem. Rather, the huge Russia has to face squarely and draw the proper implications from the fact that both Europe and China are already economically more powerful and that China is also threatening to outpace Russia on the road to social modernization. In these circumstances, it should become more evident to the Russian political elite that Russia’s first priority is to modernize itself rather than to engage in a futile effort to regain its former status as a global power. Given the enormous size and diversity of the country, a decentralized political system, based on the free market, would be more likely to unleash the creative potential of both the Russian people and the country’s vast natural resources. In turn, such a more decentralized Russia would be less susceptible to imperial mobilization. A loosely confederated Russia – composed of a European Russia, a Siberian Republic, and a Far Eastern Republic – would find it easier to cultivate closer economic regulations with Europe, with the new states of Central Asia, and with the Orient, which would thereby accelerate Russia’s own development. Each of the three confederated entities would also be more able to tap local creative potential, stifled for centuries by Moscow’s heavy bureaucratic hand. It is important to note that, when Brzezinski states that a “decentralized political system, based on the free market,” is desired for Russia, he means a system that is built on privatization, unfettered Capitalism, and the ability of private corporations to loot and exploit “the country’s vast natural resources” as well as its people. A clear choice by Russia in favor of the European option over the imperial one will be more likely if America successfully pursues the second imperative strand of its strategy toward Russia: namely, reinforcing the prevailing geopolitical pluralism in the post-Soviet space. Such reinforcement will serve to discourage any imperial temptations. A postimperial and Europe-oriented Russia should actually view American efforts to that end as helpful in consolidating regional stability and in reducing the possibility of conflicts along its new, potentially unstable southern frontiers. But the policy of consolidating geopolitical pluralism should not be conditioned on the existence of a good relationship with Russia. Rather, it is also important insurance in case such a good relationship fails to truly develop, as it creates impediments to the reemergence of any truly threatening Russian imperial policy. It follows that political and economic support for the key newly independent states is an integral part of a broader strategy for Eurasia. The consolidation of a sovereign Ukraine, which in the meantime redefines itself as a Central European state and engages in closer integration with Central Europe, is a critically important component of such a policy, as is the fostering of a closer relationship with such strategically pivotal states as Azerbaijan and Uzbekistan, in addition to the more generalized effort to open up Central Asia (in spite of Russian impediments) to the global economy. Large-scale international investment in an increasingly accessible Caspian – Central Asian region would not only help to consolidate the independence of its new countries but in the long run would also benefit a postimperial and democratic Russia. The tapping of the region’s energy and mineral resources would generate prosperity, prompting a greater sense of stability and security in the area, while perhaps also reducing the risks of Balkan-type con-external investment, would also radiate to the adjoining Russian provinces, which tend to be economically underdeveloped. Moreover, once the region’s new ruling elites come to realize that Russia acquiesces in the region’s integration into the global economy, they will become less fearful of the political consequences of close economic relations with Russia. In time, a nonimperial Russia could thus gain acceptance as the region’s preeminent economic partner, even though no longer its imperial ruler. Russia is thus faced with the choice of willing subservience or a growing NATO and Europe that will inevitably come knocking on its door for “access” to its vast oil and mineral wealth and demand that whatever political clout it may have in the world be erased. These types of requirements and conditions cannot help but initiate a direct confrontation. Brzezinski, Zbigniew. The Grand Chessboard: American Primacy And Its Geostrategic Imperatives. Basic Books. 1997. P.198. Brzezinski, Zbigniew. The Grand Chessboard: American Primacy And Its Geostrategic Imperatives. Basic Books. 1997. P. 199. Brzezinski, Zbigniew. The Grand Chessboard: American Primacy And Its Geostrategic Imperatives. Basic Books. 1997. Pp. 200-201. Brzezinski, Zbigniew. The Grand Chessboard: American Primacy And Its Geostrategic Imperatives. Basic Books. 1997. P. 201. Brzezinski, Zbigniew. The Grand Chessboard: American Primacy And Its Geostrategic Imperatives. Basic Books. 1997. P. 202. Brzezinski, Zbigniew. The Grand Chessboard: American Primacy And Its Geostrategic Imperatives. Basic Books. 1997. P. 202-203. Brzezinski, Zbigniew. The Grand Chessboard: American Primacy And Its Geostrategic Imperatives. Basic Books. 1997. P. 203.